Background: Quercetin is one of the dietary flavonoids found in citrus fruits and leafy vegetables as well as seeds and green tea. Its name comes from Quercetum and belongs to flavonol class which is not synthesized in the human body. Many studies revealed a significant effect of quercetin in advancing psychomotor/cognitive performances and reversing the neurotoxin-induced neuronal damage. Therefore, the present study aimed to illustrate the central effect of quercetin on human vigilance and in normal healthy volunteers. Subjects and Methods: A total of fifty healthy volunteers with a mean age of 23 years were enrolled in this experimental study; they were divided into two groups: Group I: twenty healthy volunteers treated with placebo (500 mg/day starch capsule) for 2 weeks and Group II: thirty healthy volunteers treated with quercetin 500 mg/day for 2 weeks. Each volunteer in each group was subjected to vigilance-psychomotor testing by Leeds psychomotor performance tester which measures Psychomotor-vigilance test (PVT) and Cortical arousal activity (CAA). Results: Quercetin produced a more significant effect on total reaction time, recognition reaction time, movement reaction time, fusion index, % fusion (P < 0.01), and flicker percentage (P < 0.05) compared to control, but quercetin produced an insignificant effect on CFFd, critical flicker-fusion frequency, and flicker index. Conclusion: Quercetin improves psychomotor performance and CAA in normal healthy volunteers. Background: Lateral orbitotomy is a well-known approach for lesions of the lateral, superior, and inferior part of the orbit, especially for extraconal lesions. A surgical technique which includes avoiding temporalis muscle aggressive retraction and cutting but meticulous retraction is used instead accompanied with experience of the surgeon about the anatomy of the orbit and avoiding extensive bleeding with the subsequent high infection predisposition; all these factors contribute to the low percentage of complications. Materials and Methods: Ten cases were operated upon during the period from 2012 to 2016 in medical city, neurosurgical department. In this regard, contrast-enhanced computed tomography scans gives useful information for operative strategy. All patients were approached using lateral orbitotomy procedure utilizing microsurgical technique taking in consideration meticulous retraction of the temporalis muscle, the site of the lesion, and its relation to the important orbital structure. Objective: The objective of this study is to assess of factors that minimize operative and postoperative lateral orbitotomy complications. Results: Ten cases operated with consideration to factors reducing complications of those six patients were female, with age range between 35 and 57 (mean 43 years). In four patients, the lesion was cavernous hemangioma, one patient optic nerve glioma, two patients lacrimal gland pleomorphic adenoma, and three patients exophthalmus due to Grave's disease (thyroid eye disease). With meticulous care during muscle retraction without cutting, it had no significant risk of bleeding intra operatively, one patient had early postoperative infection, and another case had unacceptable scar. Conclusion: The success of surgery can be improved, operative and postoperative complications can be reduced, and cosmetic problems become acceptable if a meticulous care is taken during temporalis muscle retraction and using microsurgical technique. Operation done by an expert surgeon familial with the anatomy of the orbit, avoiding extensive bleeding that need drainage system which predispose to high infection rate, will reduce operative and postoperative complications. In addition good operative field matching with the size and the type of the lesion play a role in minimizing the complications. Background: Acute decompensated heart failure (HF) is a clinical syndrome that results when abnormalities in the structure and function of the myocardium impair cardiac output or decrease filling of the ventricles. Anemia is a common comorbidity in patients with chronic HF (CHF), is associated with increased disease severity, and may contribute to a worse the outcome. Aim of the Study: To study the relationship between iron level and left ventricular function (LVF) in patients having acute decompensated HF and the effects of iron supplement on this function. Patients and Methods: This cross-sectional study was conducted in the medical wards of Baghdad Teaching Hospital at different times during the period between October 1, 2016, and May 1, 2017. It included 60 patients diagnosed with CHF (9 patients with HF with preserved ejection fraction [EF] and 51 patients with HF with reduced EF) and admitted to the medical wards due to acute decompensation. For all patients, history, cardiological examination, New York Heart Association classification, electrocardiogram, and chest X-ray were done. Body mass index was measured. Standard echocardiography was performed. Hematological parameters were measured including hemoglobin (Hb), mean corpuscular volume, mean corpuscular Hb (MCH), MCH concentration, blood film, serum iron, erythrocyte count, total iron-binding capacity, and transferrin saturation. Results: Serum iron was significantly lower in patients with impaired EF with median serum iron 41 versus 94 mcg/dL in preserved EF (72.5% vs. 0%). Transferrin saturation was statistically and significantly lower in patients with EF <50% (39.2% of the patients with impaired EF had low transferrin saturation [P < 0.001] compared to 0% in patients with preserved EF). EF had inverse significant correlation with total binding capacity of iron (r = −0.585, P < 0.001). Iron supplements as ferrous sulfate have a highly significant effect (P < 0.001) on improving the LVF and EF, iron level and transferrin saturation in patients with decompensated HF with low EF. Conclusions: Most HF patients with low EF in this study had reduced iron level and transferrin saturation comparing to those with preserved EF. Iron supplement in a patient with low EF preserved the EF in them. Anemia still is founded in patients of HF with acceptable EF in the presence of normal iron status, and this is explained by other causes rather than iron deficiency. Background: High-risk neonate defines as one who requires more than the standard monitoring and care offered to a healthy term newborn infant; therefore, early detection of neonatal illness is an important step toward improving newborn survival. Objectives: The objective of this study is to assess the knowledge and health-seeking practices of mothers attending primary health-care centers about WHO recognized danger signs in newborns. 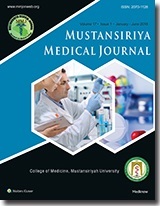 Subjects and Methods: A cross-sectional study was carried out in primary health-care centers selected conveniently in Baghdad-Alkarkh district. Participants were 275 mothers of child-bearing age group selected conveniently; the data were collected during the period from March 1 to June 30, 2017. A general questionnaire used for the data collection. 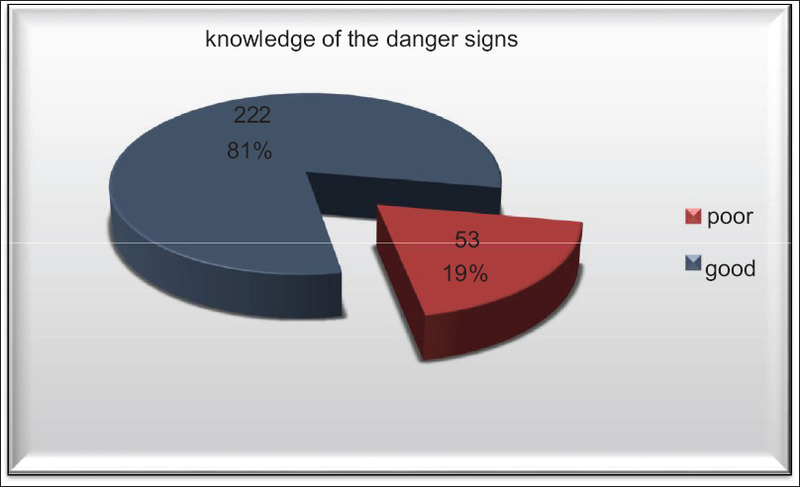 Results: About 81% of mothers in study sample listed three or more of the who recognized danger signs. About 71.7% of mothers tend to seek advice or treatment for the illness outside the home. The proportion of good knowledge and health-seeking practices was higher in (Educated, employee, mothers who had a history of antenatal care attendance with higher number of visits). There was no relationship between number of children and family support with seeking care outside the home. Mothers who had good knowledge of danger signs of their babies tend to seek care from health facilities more frequently 75%, and this relation was statistically significant, 61.2% of mothers who perceive illness in newborns delayed seeking advice or treatment outside the home, 66% not taking newborn to the health facilities because they expect self-resolution of the illness. There is good knowledge and perception of mothers toward some danger signs such as fever, poor feeding, and jaundice while fair toward others such as cold body, chest indrawing, and signs of local infections. Conclusion: There are good knowledge and perception of mothers about the WHO recognized danger signs in newborns; however, there is a gap between mothers' knowledge and their health-seeking behavior for sick newborn and explored their deep perceptions, constraints, and various treatments. Objective: This study was designed to discriminate between fetal growth restriction that is placentally mediated and constitutionally small fetuses depending on the measurement of placental growth factor (PlGF) in the maternal circulation. Study Design: This was a prospective case–control study. Settings: This study was conducted at the Department of Gynecology and Obstetrics at Al-Yarmouk Teaching Hospital. 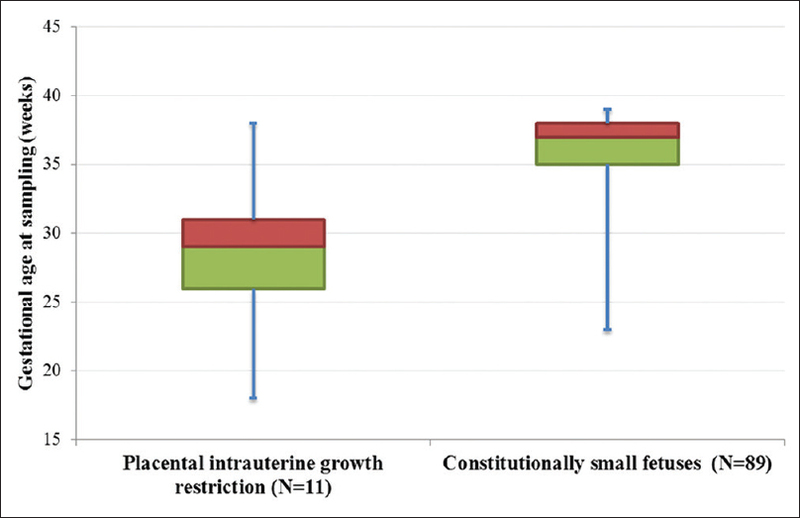 Patients and Methods: The study included 100 cases (11 placental intrauterine growth restriction [IUGR] and 89 constitutionally small) with singleton pregnancies. Serum PlGF was measured by ELISA technique. Concentration less than the 5th percentile for normal pregnancy was considered a positive PlGF test. Results: A positive PlGF test was found in 10 out of the 11 placental growth restriction cases and in 4 out of the 89 constitutionally small fetuses. PlGF can differentiate between IUGR due to placental dysfunction from constitutionally small fetuses with 90.1% sensitivity and 95.5% specificity. Conclusion: PlGF may serve as a promising tool to identify placental IUGR antenatally. Background: Leishmaniasis encompasses a spectrum of chronic infections in humans in which organisms are found within phagolysosomes of mononuclear phagocytes. Cutaneous leishmaniasis is divided into Old World and New World cutaneous leishmaniasis caused by Leishmania tropica. Aminoglycosides as it antibacterial, were also tried as a new therapeutic option for parasitic infestation. Proliferation rate and protein synthesis in the promastigote stage of the parasite are inhibited by aminoglycoside such as streptomycin. Aim: The aim of this study is to estimate the effectiveness of intralesional streptomycin as a new antileishmanial agent. Settings and Design: This was a therapeutic trial with controls. Materials and Methods: Sixty three lesions (57.8%) from a total of 109 lesions were treated with intralesional injection of streptomycin after dilution with distilled water (20%) and 46 lesions (42.2%) were used as a control. Statistical Analysis: Statistical Analysis System program and Chi-square test were used. Results: In Group A, clinical cure was achieved in 40 lesions (83.3%). Moderate response was noticed in 8 lesions (16.7%). In Group B, none of the remaining 39 control lesions shows moderate, marked or total clearance degree of response. Only 3 lesions (7.7%) showed a slight degree of response and 1 lesion (2.7%) with mild degree. Conclusion: Intralesional streptomycin solution 20% can be considered as a new effective therapeutic option for cutaneous leishmaniasis. Background: Studies have been done to investigate the association between a single-nucleotide polymorphism (SNP) of interleukin-27 (IL-27) gene and the recurrent pregnancy loss (RPL). However, different results have been found in different spots of the world. Therefore, more studies are needed to understand the variation in these results. This is the first study that shows the implication of the SNP of IL-27 gene in RPL. Objective: This study aims to investigate the association between RPL and SNP of gene (−964 A > G) in Iraqi women. 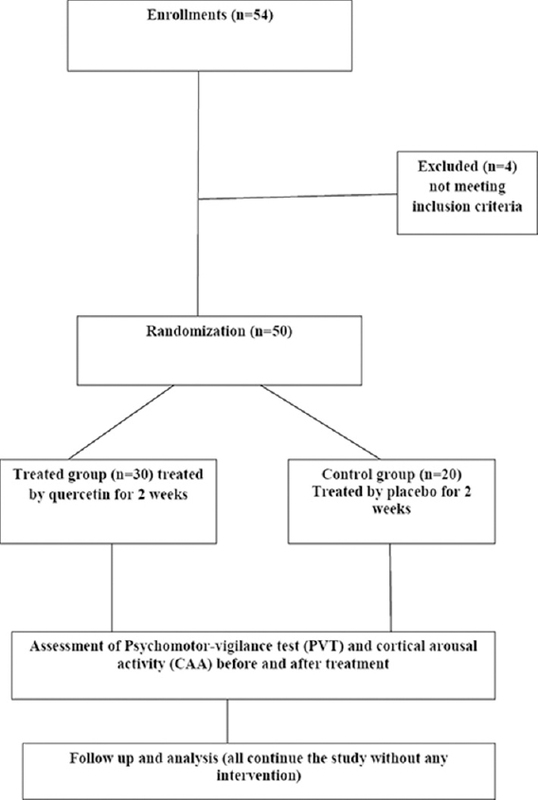 Materials and Methods: From September 2013 to September 2014; 100 women, as a control group, and 100 women (with three or more consecutive pregnancy loss), as a study group, were recruited to investigate the association between the IL-27(−964 A > G) SNP and the PRL. The IL-27(−964 A > G) SNP was determined using polymerase chain reaction-restriction fragment length polymorphism technique. Genotype and allele frequencies were compared using Fisher test between the two groups. P < 0.05 is considered to be statistically significant. Results: The age and body mass index were both not significantly different between the two groups. The frequencies of genotypes of this polymorphism in the RPL group were AG (60%), AA (31%), and GG (9%), while these frequencies were AG (21%), AA (68%), and GG (11%) in the control group. The genotype frequencies of the −964 A > G polymorphism was significantly different between the study and the control groups (P = 0.007). The allele frequencies of this polymorphism were A (35%), G (65%) in the RPL group versus A (61%), G (39%) in the control group. The frequencies of A and G alleles in the both groups were not significantly different. Conclusion: IL-27 (−964 A > G) polymorphism is a risk factor for RPL in a sample of Iraqi women. However, this is different from what has been found in some studies which might implicate other factors in the RPL. Background: The world is aging with people living longer and fewer children being born; the number of old people is increasing, and thus the aging of populations demands a comprehensive public health response. Objective: The objective of this study was to shed light on the health-care services for old people in age-friendly primary health-care centers (PHCCs) in Baghdad city in respect with its availability, accessibility, and utilization. Methods: This is a descriptive cross-sectional study that was conducted in 22 age-friendly PHCCs in Baghdad. The evaluation was based on the WHO age-friendly PHCCs toolkit. The checklist comprises a list of questions related to clinical services. Results: Wheelchairs were present in 100% of the centers, 85.7% of centers in Al-Karkh and 62.5% of centers in Al-Russafa have clear emergency exits, and all the centers have essential equipment and investigations. Free services for the elderly were not present in any of the centers; the referral system was weak with no feedback. Computerized health information system was present in only quarter of the centers. Conclusion: All the age-friendly PHCCs lack a special unit for the elderly. Most of the centers do not have a suitable source of drinking water. There are some criteria that comply with the WHO instructions, but there are other essential services that should be available to improve the health services and utilization of these services. Background: Endothelial dysfunction is an initial key step in the pathogenesis of atherosclerosis. Many tests developed to measure endothelial function, most of which are either invasive or semi-invasive. 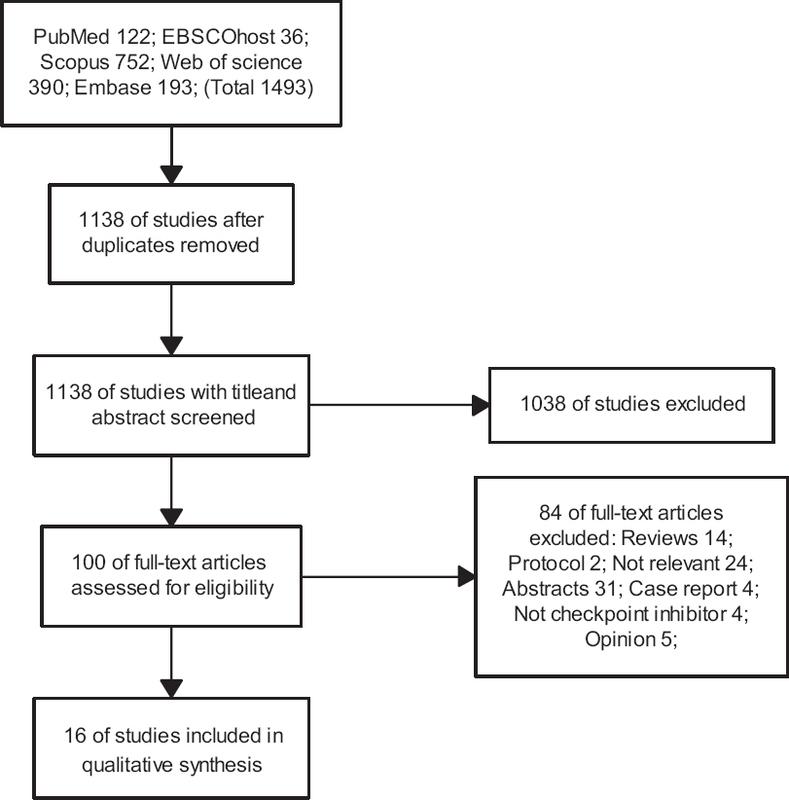 The unique nature of brachial artery reactivity test of being a noninvasive, quantitative, and repeatable procedure is gaining increasing interest as an index in assessing endothelial cell function. Aim of Study: The aim is to study the assessment of endothelial function among a group of patients with type 2 diabetes mellitus (DM), using brachial artery reactivity test. Patients and Methods: In a case control study enrolling 35 patients with type 2 DM matched against a similar number of nondiabetic participants of related genders and age groups to trace the brachial artery diameter both at rest and in response to reactive hyperemia using a commercially available U/S machine equipped with a high-resolution linear probe (7.5 MHz) following an already defined U/S protocol. Results: The diabetic participants revealed a statistically significant attenuation in brachial artery dilatation in response reactive hyperemia when compared with nondiabetic group (mean ± standard deviation) (4.63 ± 0.4 mm vs. 5.61 ± 0.47 mm). Comparing the two groups, a statistically significant impairment of the brachial artery dilatation is traced in relation to the atherosclerotic risk factors both in isolation and in clusters. Moreover, strict glycemic control (HbA1c ≤6%) significantly altered the response to vasodilatation (0.74 ± 0.17 mm vs. 0.43 ± 0.14 mm, P = 0.0001). Age, gender difference, and duration of diabetes did not significantly alter the results. Conclusions: Endothelial dysfunction is not uncommon among patients with type 2 DM. Brachial artery reactivity test is a well-accepted, noninvasive, repeatable, and a quantitatively reproducible index to trace endothelial function.